COMPLETE THE RETURNS & EXCHANGES FORM AND INCLUDE IT IN YOUR SHIPMENT! All item(s) returned for a refund must be in new and sellable condition. This includes the original tags for apparel items. TRY ALL ITEMS ON INDOORS. DO NOT PLAY IN THEM. THEY MUST BE IN NEW AND SELLABLE CONDITION. Returns made over 120 days after the original purchase receive a credit to their SoccerMaster.com account. Returns made within 120 days receive a full refund not including shipping and taxes. For all refunds/credits you must have proof of purchase. Proof of purchase required for all returns. If you don’t have proof of purchase we will not be able to offer a refund or credit. Proof of purchase is your email confirmation, the packing slip received with the shipment, or your order number. All items returned must be shipped in a shipping box. 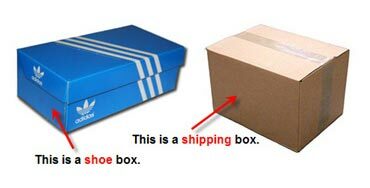 Shoes or other items shipped in the product box with a shipping label stuck to it will not be accepted or returned. Because we want all customers to have a great experience, we won’t sell returned items as “new items” if they aren’t in new condition – including the box and original manufacturer tags. PLEASE RETURN SHOES IN THEIR ORIGINAL SHOE BOX PLACED INSIDE A SHIPPING BOX. Over 180 days: No credit is provided. Orders over 180 days must contact the manufacturer directly regarding defects. SoccerMaster.com is not responsible for the manufacturer’s decision to accept or reject your request to replace a defective item. Team Order Returns & Exchanges – For returns and exchanges on any team order there is a 15% restocking fee on all refunds. Shipping back to SoccerMaster.com is paid for by the customer. If you ordered a Clearance Item, we don’t refund these. Sales are final on clearance items unless there is a defect. You are NOT able to return or exchange items purchased online in any of the Soccer Master retail stores. ALL online purchases that require a return or exchange must be coordinated with the online store. Use of the Return Service label for SoccerMaster.com is an $8.00 fee to your customer account. Any item marked as CLEARANCE is not considered for any refund or exchange unless the item is found to be defective within 30 days of purchase. If a CLEARANCE item is defective an exchange for a similar item is allowed. Yes, it is safe. SoccerMaster.com processes credit card transactions through a secure socket layer (SSL) provided by Thawte. In plain English, this means that your personal and credit card information is encrypted so that it cannot be intercepted and read as it travels through Internet space. SoccerMaster.com guarantees to protect and respect your privacy. SoccerMaster.com delivers orders within the United States and various international destinations. Available destinations are listed in the checkout process. We accept credit card payment through Visa, MasterCard, Discover, American Express and PayPal. Our staff is available to assist you with your order. Call 877-639-7605 for customer support. English is the only language available through our customer service. Upon completing your online order we will confirm the order by email and update your account within 24 hours. You may login to your account at the “My Account” link in the top right corner of SoccerMaster.com to check the status of your order. You will also receive an email anytime the status of your order is revised. FREE ECONOMY SHIPPING FOR ORDERS OVER $50 (DOMESTIC ADDRESSES ONLY). You may expedite shipment of your package(s) during the checkout process by choosing one of the expedited options (additional fees will apply). *Free Economy Shipping does not include USPS Priority Mail, USPS International service, UPS Freight, oversized items and shipments outside the United States. Team Orders, Large goals, PUGG goals, field equipment, SoccerWaves and other oversized items do not qualify for Free shipping. For more detail please contact SoccerMaster.com at [email protected]. You will also see shipping costs described in detail during your checkout process. We ship your order as quickly as possible. All items that are in stock at SoccerMaster.com will be shipped within 1-3 business days through UPS or USPS. You have the option in the Checkout to expedite the shipping method for an additional fee. Shipments may be delayed due to holidays, weather delays while in transit or other unforeseen occurrences. For time sensitive deliveries please call SoccerMaster.com to confirm estimated shipping time. USPS DOES NOT DELIVER ON SUNDAY. *UPS Next Day Air service is not always available. SoccerMaster.com makes every effort to ship UPS Next Day Air Service out the same day ordered as long as that order is submitted by 3pm CST Monday-Friday (not on UPS holidays). UPS Ground and USPS Priority Mail (delivery usually within 3-7 business days): USPS Priority Service rates determined by weight and calculated during checkout. Orders placed after 3 p.m. on Friday and before 8 a.m. CST on Monday will not ship prior to Monday. Items shipped direct from the manufacturer may be expedited. SoccerMaster.com will contact you within one business day if there are any exceptions. UPS SurePost service shipping within the Continental U.S. is FREE at SoccerMaster.com for all orders $50 or more. UPS Ground is $5.99 for orders less than $100. UPS Freight and USPS Priority Mail shipments are not included from the Free Shipping service. SoccerMaster.com is also able to ship to Canada and United States territories. A list of available countries is presented during the checkout process. Please ship your item back to SoccerMaster.com at your expense. A label is provided for UPS Ground service (where available) for an $8.00 fee. This fee will be charged to your account if it is used. The UPS Return Service label is for your convenience and will help SoccerMaster.com process your exchange or refund. Please include the form found at http://www.SoccerMaster.com/ship-it-back with any return shipment.Once your request for exchange has been received and processed it will ship back to you by ground service at no cost to you. SoccerMaster.com believes in offering you the widest selection of products available on our site. On occasion, an item on the site is only available through our vendor’s warehouse. If such an item is in your order, we coordinate with the vendor to have the item(s) sent directly to you. This process reduces the time to delivery to you. When this occurs, you may receive multiple packages. Because shipping varies with each vendor, delivery times vary but are usually within 5-10 business days. There is never a need for you to contact the manufacturer; neither for shipment, returns, or exchanges. SoccerMaster.com works really hard to make sure that everything on the site is in stock, ready to ship, and priced appropriately. SoccerMaster.com does not warrant that the site will be error-free. Should a site error ever arise, we will fix it ASAP. Pricing and availability of products on the site and in our retail store are subject to change without notice and are at the discretion of SoccerMaster.com. For orders made from within the United States, sales tax will be applied to all orders shipped to a Missouri address. CANADA SHIPMENTS: EFFECTIVE OCTOBER 17, 2011 shipments to Canada will show Sales Tax which also includes the Duties and Brokerage fees related to shipments to Canada. Get a quote for your team or club’s uniforms. SoccerMaster.com offers competitive pricing and a wide variety of styles to choose from. For returns and exchanges on any team order there is a 15% restocking fee. Shipping back to SoccerMaster.com is paid for by the customer. Yes, it is safe. SoccerMaster.com processes credit card transactions through a secure socket layer (SSL) provided by Thawte. SoccerMaster.com has partnered with a trusted third-party company, GlobalShopex.com to fulfill orders for our international customers. Simply put any items you wish to purchase in your shopping cart and choose the “international checkout” option. The items will automatically be transferred to the GlobalShopex cart. You may pay with international credit cards, PayPal and bank wire transfers. GlobalShopex will process your payment and guarantee delivery. Once your order is completed, all inquiries should be directed to GlobalShopex at [email protected] or (786)314-7144. How long does it take to ship the item? How long will it take to get to me once it’s shipped? All items listed as “In Stock” are either in stock at the SoccerMaster.com warehouse or available to ship Direct from the Manufacturer. There are no Backorder items at SoccerMaster.com. However, we are unable to ship internationally with Direct from Manufacturer items. These product will ship to SoccerMaster.com first and then to the international customer. This may delay your shipment by 3-7 business days. No additional fees are changed for this type of handling. All “In Stock” items available in the SoccerMaster.com warehouse will ship within 1-3 business days. SoccerMaster.com works very hard to ship all items within 1 business day. How should I contact SoccerMaster.com? We recommend that your reply to your web order confirmation email with any questions. SoccerMaster.com customer service is only available in English. We apologize for any inconvenience. SoccerMaster.com Servicio de Atención al Clienteestá disponible sólo en Inglés. Por favor, [email protected] correo electrónico con cualquier pregunta. SoccerMaster.com Service à la clientèle est disponible en anglais seulement. S’il vous plaît [email protected] e-mail avec toutes les questions. SoccerMaster.com Customer Service ist nur in Englisch verfügbar. Bitte [email protected] E-Mail mit Fragen. SoccerMaster.com Atendimento ao Cliente está disponível apenas em Inglês. [email protected] envie um e-mail com qualquer pergunta. SoccerMaster.com Customer Service è disponibile solo in inglese. Si prega di [email protected] e-mail con tutte le domande. SoccerMaster.com kundtjänst finns bara på engelska. Skicka ett mail [email protected] med eventuella frågor. SoccerMaster.com Obslugi Klienta jest dostepne tylko w jezyku angielskim. Prosimy o e-mail [email protected] z wszelkimi pytaniami.